On CNN, Fox News and MSNBC. The past few months have seen a parade of newly launched presidential campaigns, each hoping to march through the primaries and on to the White House. The streets have gotten rather crowded — the Democratic field has ballooned to more than a dozen candidates. But voters haven’t heard the same amount of noise from each campaign, because cable news has amplified their launches differently. To measure the media response to these campaign announcements,1 we again turned to the Internet Archive’s Television News Archive, with the help of the GDELT project’s television explorer. 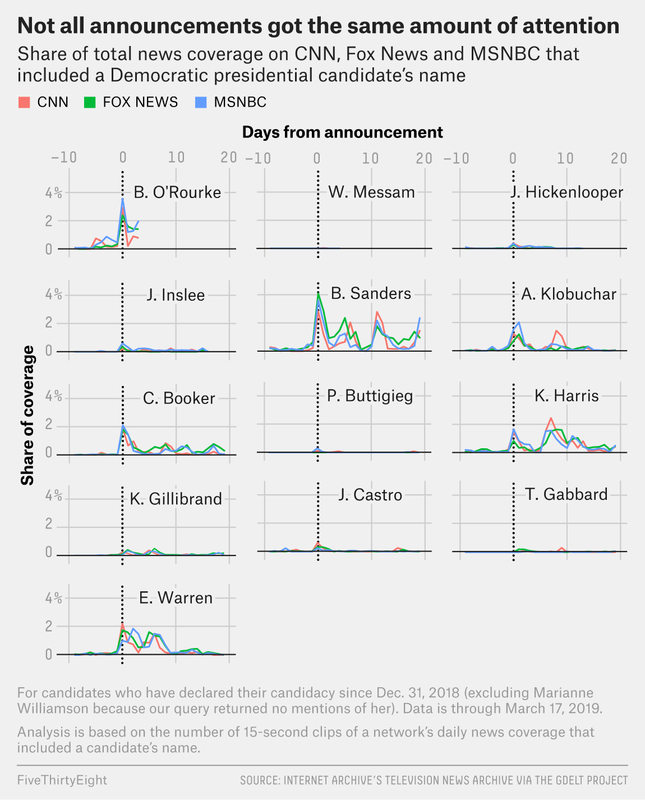 We used this data to figure out what share of the overall news coverage on CNN, Fox News and MSNBC mentioned a candidate in the days leading up to and after the campaign announcement. (For candidates whose campaigns have launched since Dec. 31, 2018. )2 We found that Bernie Sanders and Beto O’Rourke saw dramatic, mountainous peaks in mentions immediately following their announcements, and in some cases still days after. Cory Booker, Kamala Harris, Amy Klobuchar and Elizabeth Warren saw more modest bumps. And others — such as Pete Buttigieg, John Hickenlooper and Jay Inslee — saw molehills. The three networks appeared to respond to each campaign’s announcement more or less in kind, although there were some differences. Fox News mentioned Sanders more, for example, while MSNBC was more outspoken than the other networks in mentioning O’Rourke. Of course not all coverage is the same, even if it comes out of the television at the same volume and in the same quantity. So we also tallied how the cable networks talked about these newly minted Democratic candidates by looking at the words that were uttered near their names in the networks’ coverage. The words that were most likely to indicate that coverage was about a particular candidate3 provide small snapshots: “socialism,” “socialist” and “2016” were most specifically associated with Sanders; “mayor” and “chance” with Booker; “exploratory” and “committee” with Warren; “congressman” and “fair” with O’Rourke; “insurance” and “health” with Harris; “women” and “exploratory” with Kirsten Gillibrand; and “mayor” and “guy” with Pete Buttigieg. After all of these announcements, the Democratic field is nearly set, and there is only one candidate — Joe Biden — who is both likely to enter and who is thought to have a real chance at the nomination. If and when he does officially enter the race, we’ll gauge the noise his campaign makes on TV and add it to the chart above. The whole parade is nearly on the march, and the noise is unlikely to die down any time soon. We chose the launch dates according to when a candidate was widely seen as entering the race for president, whether that was a public announcement of candidacy or of the formation of an exploratory committee. A couple of candidates — Elizabeth Warren and Kirsten Gillibrand, in particular — had in effect two presidential “launches,” one when they announced their exploratory committee and another when they launched their candidacy itself. We’re focusing on the former date for those two candidates. In Warren’s case, it should be noted, both events earned heavy coverage. Specifically, we investigated coverage 10 days before to up to 20 days after each campaign’s announcement — our data ends on March 17. The Television News Archive measures share of coverage by chopping all the news that aired on each network into 15-second clips and counting how many clips mention the phrase in which we are interested — in this case, candidate names. To find these words, we first compiled a master list of words that occurred in every 15-second clip that mentions any of the candidates and selected only words that appear in at least 1 percent of those clips. We then removed commonly used words like “and,” “the” and “him.” Finally, we found the words that were most distinctive to each candidate using a probabilistic classifier, excluding candidate names themselves and the names of their home states.